In his definitive The Dawn of Indian Music in the West Peter Lavezzoli describes John McLaughlin's album My Goal's Beyond as "an introverted and largely forgotten masterwork" and the two opening tracks 'Peace One' and 'Peace Two' as "remarkable precursors of Shakti in particular, of the Mahavishnu Orchestra to a lesser extent, and of other world fusion efforts in jazz, including Oregon and the work of Collin Walcott". 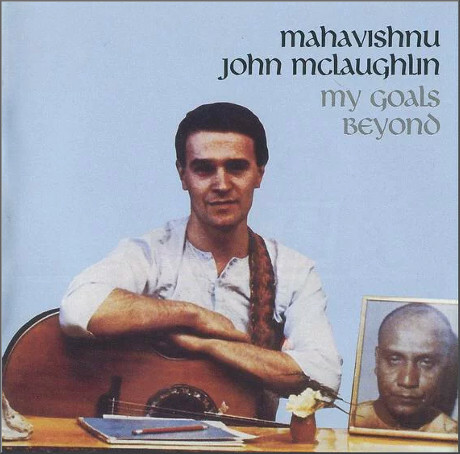 When My Goal's Beyond was released as an LP in 1971 it used the artwork seen above showing a portrait of the mercurial guru Sri Chimnoy alongside McLaughlin. Chimnoy was born in what is now Bangladesh and studied in an Indian ashram for twenty years before opening a teaching centre in New York in 1964. He founded the Sri Chinmoy Centre organisation and was a prolific composer of sacred music, mainly songs in Bengali and English. Chimnoy teachings advocated "self-transcendence" by expanding one's consciousness to conquer the mind's perceived limitations. He gave John McLaughlin the spiritual moniker Mahavishnu used for the guitarists most celebrated band, and McLaughlin's albums of the period were liberally sprinkled with his guru's soundbites. Among Chimnoy's other gurupies were Mikhail Gorbachev, Roberta Flack, Olympic gold-medalist Carl Lewis, John McLaughlin, Carlos Santana and, inevitably Sting. 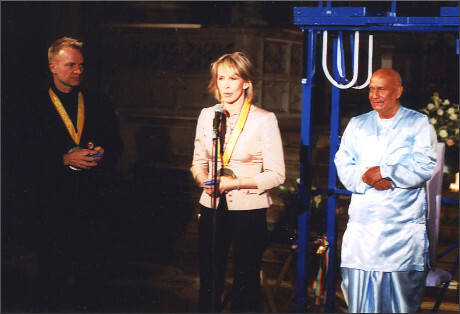 In the photo below Sting and his wife Trudie are with Chimnoy at the Fourth Universalist Church, New York in 2003. When Sri Chinmoy died in 2007 the Independent's obituary described him as "spiritual leader and peace activist" and Philip Glass and Ravi Shankar were among those who paid tribute to him. But my portrait of the now forgotten composer Olivier Greif described how like so many gurus Sri Chimnoy fell from grace. Following his split with Chimroy Carlos Santana described his former guru in a Rolling Stone interview as "vindictive", and elsewhere there are allegations of homophobia. In 2009 Jayanti Tamm published her best selling book of life as a Chinmoy disciple Cartwheels in a Sari: A Memoir of Growing Up Cult in which she documents his "masterful tactics of manipulation", and there have also been allegations of sexual misconduct. 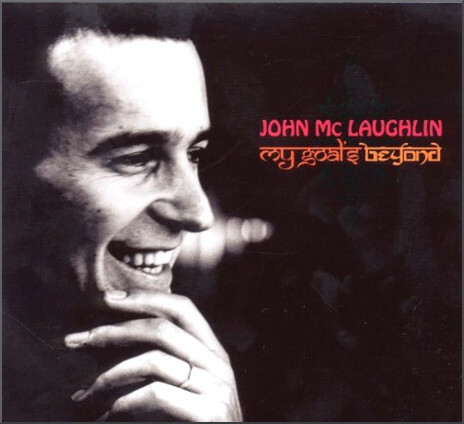 All of which meant that when John McLaughlin's My Goal's Beyond was transferred to CD the Sri Chimnoy visual was quietly dropped and replaced by the artwork below; a cover which, incidentally, must win the award for the most arcane typography ever. As Jiddu Krishnamurti told us: "Leaders destroy the followers and followers destroy the leaders". But his relationship with the tarnished Sri Chimnoy should not detract from the merit of John McLaughlin's contemporaneous music. Peter Lavezzoli's advocacy of My Goal's Beyond speaks for itself, and, as they say on Amazon, if you liked Don Cherry, Nana Vasconcelos and Colin Walcott's Condona albums you will like it. 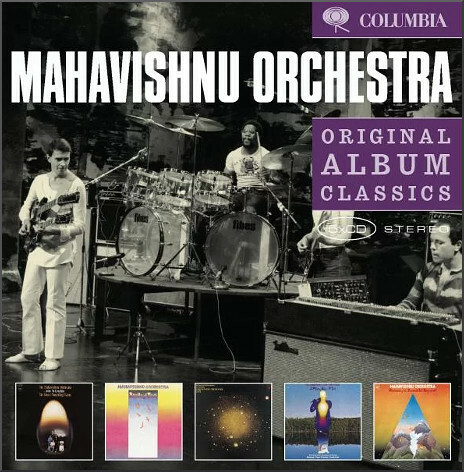 Also recommended is the bargain reissue of five great Mahavishnu Orchestra Columbia discs in Sony BMG's Original Album Classics series. For readers who cannot survive without their regular Western classical fix it should be noted that included is Apocalypse which the Mahavishnu band recorded with Michael Tilson Thomas and the London Symphony Orchestra in 1974. We have always been at great pains to STRESS that this journey is an 'EXPEDITION' rather than a 'TOUR' in the normal sense. IT IS NOT - the MOST COMFORTABLE WAY OF TRAVELLING. IT IS NOT - the CHEAPEST WAY OF TRAVELLING. It is a rugged, rewarding journey that will take you across mountains and deserts and into the remotest parts of some very primitive countries. It will bring you into the company of people who are warm, 'happy go lucky', tolerant and human - so if there is any 'gingerbread' in your make up, better stay away! Bluntly - it is a trip for the genuine TRAVELLER rather than the modern TOURIST. Luxury does not exist all along the overland route. Hotels range from excellent to pretty putrid but all are endurable and if you can rise above the limitations of 'creature comforts' you will certainly enjoy this trip. OUR WARNING IS NO STUNT - so please - please - for your sake, for our sake, for God's sake! - stay away if you want mollycoddling.